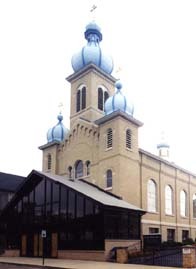 All Saints Orthodox Church is located in Olyphant, PA, Lackawanna County, in Northeast PA near Scranton, PA.
Take Route 6 East (Robert Casey Highway) towards Carbondale. Take the second exit which is E. Lackawanna Ave and turn left onto E. Lackawanna Ave. Follow it to the end then make a left. At the traffic light make a right over railroad tracks. Continue to the next intersection which is Delaware Ave and turn right. At stop sign make a left on W. Grant St. At next stop you will see the church. Continue to the next stop sign turn right onto Willow St and right into Church parking lot. 6:30 PM Great Vespers with Litya. Please see our web site.